Thank you to all the fine folks who joined us for Festival of Rock Posters at Hall of Flowers (San Francisco County Fair Building) this past Saturday, October 22, 2016 in Golden Gate Park. It was a grand time celebrating the 50th Anniversary of the psychedelic rock poster, and experiencing how this art form has remained relevant, especially in the digital age. This year we saw record attendance, with our Artist Relief Trust posters by the legendary Stanley Mouse selling out within an hour of opening. This silkscreen poster is extra special because all proceeds from the sale go directly to benefit an artist in need. Thank you for your support. We look forward to seeing pictures of your copy, signed by Mouse on social media. Well I'm on my way back to London, thanks to Marty @trpsorg and all the volunteers for putting on such a great event, and thanks to all the folks that picked up some of my work for making a super successful outing for me! I'humbled and honoured anyone would pick up my stuff when there is SO MUCH AMAZING work at hand. Here is the TRPS artist group shot, there are too many legendary names for one post to handle, but check my previous artist list post to who is all here. Thanks again everyone! Till next time. Mark your calendars for Saturday August 6, 2016 when Rock Art By the Bay returns to the Mission Masonic Center in San Francisco. You won’t want to miss the opportunity to see the inside of a working Masonic Lodge, as well as to meet the artists who will be joining us. Scan the QR code with your smart phone for Facebook event details, or click this link for more. 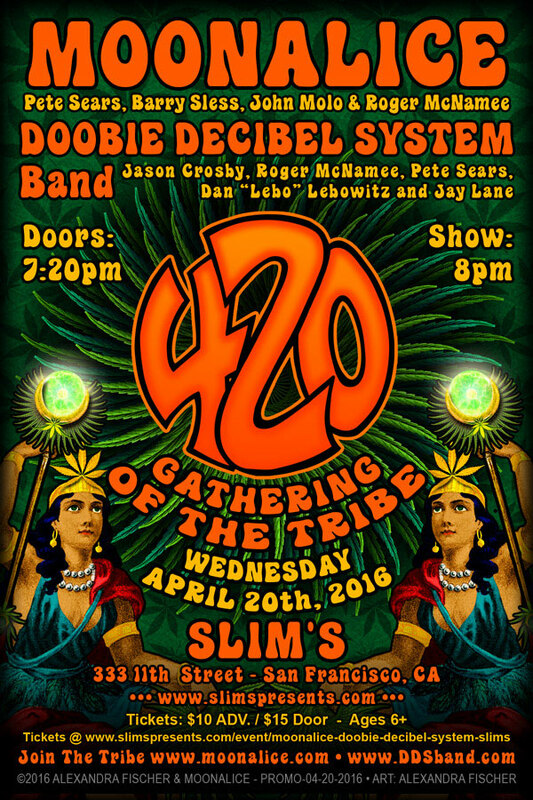 On Wednesday, April 20, 2016, Moonalice will be hosting their annual 420 Gathering of the Tribe celebration at Slim’s in San Francisco. 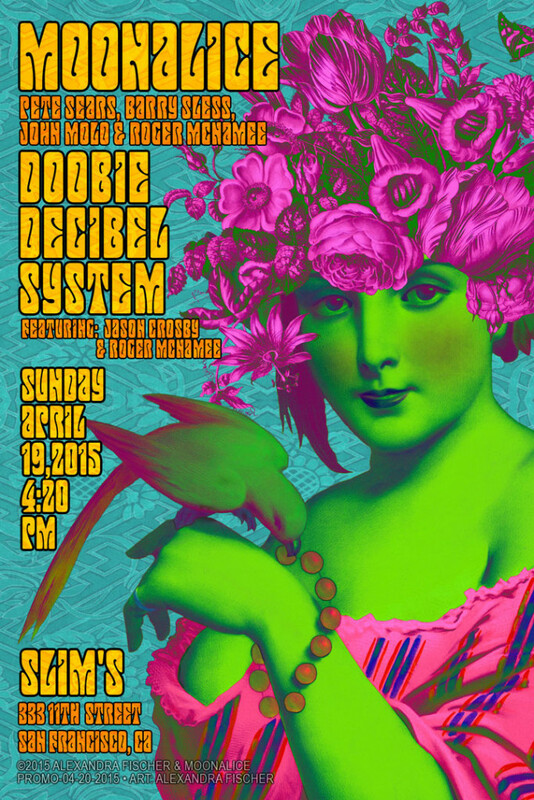 This spring themed event is sure to please with music by opener Doobie Decibel System Band (Jason Crosby, Roger McNamee, Pete Sears, Dan “Lebo” Lebowitz & Jay Lane) and includes a special poster show highlighting the Moonalice and Doobie Decibel System series. Poster fans will appreciate the $10 ticket price which includes a FREE set of 21 posters commemorating the event. The special set include art by: Lee Conklin, David Singer, Lauren Yurkovich, Darrin Brenner, Carolyn Ferris, Dennis Larkins, Gregg Gordon, John Mavroudis, Dennis Loren, Jason Wilson, John Seabury, Stanley Mouse, Patricia & George Sargent, Dave Hunter, Jennaé Bennett, Christopher Peterson, Wes Wilson, Winston Smith, Prairie Prince, Ron Donovan & Chris Shaw. Many of the poster artists will be attending this event. There will also be 2 silkscreen posters available to purchase. 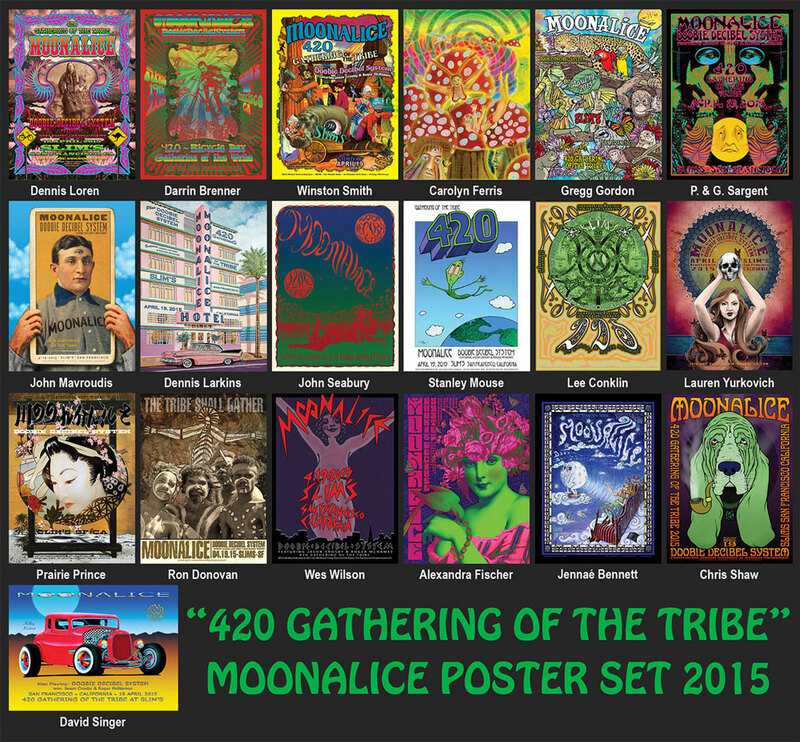 Tickets available online, more information at moonaliceposters.com. This psychedelic spring party on 4/19/15 will include a poster exhibit, photo booth, festive magician, raffle, and many more treats! Tickets only $5.00, available here. Every guest will receive a 19 poster set by well-known artists including: Dennis Loren, Darrin Brenner, Winston Smith, Carolyn Ferris, Gregg Gordon, Pat & George Sargent, John Mavroudis, Dennis Larkins, David Singer, John Seabury, Stanley Mouse, Lee Conklin, Lauren Yurkovich, Prairie Prince, Ron Donovan, Wes Wilson, Alexandra Fischer, Jennaé Bennett, and Chris Shaw. There will also be a silkscreen concert poster by Gary Houston available for purchase.